I don't know how long these have been online, but there are some clips on the Oscars.org site from the Milt Kahl retrospective they held in April of this year. Includes lots of good anecdotes from a variety of animators and relatives, and even some of Brad Bird recounting his tutelage under Kahl. Unfortunately there is not supporting footage of Kahl's work, but that's just a Google (or a DVD) away. Thanks for posting this Victor! Along with the recent CTN show, this was one of my favorite live events of the year. I'll never forget watching Andreas Deja going through a stack of Milt Kahl drawings one by one...amazing stuff! I waited too long to get the tickets and it sold out.. thanks Victor, I can get to see it now. Thanks, Victor. 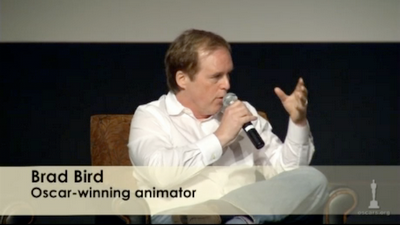 I always love to hear Brad Bird speak (I felt let down when the Ratatouille dvd had no commentary). There is a great panel discussion available on youtube for fellow Pixar geeks. It's called Pixar - A Human Story.Check it out. Mike, thanks for the link. By the way, if you get the BluRay of Ratatouille you can hear the Brad Bird commentary. Lots of other goodies, too. Awesome Victor! Thanks. That sounds like a great excuse for buying a BluRay player. this guys never graduated to college and started as a newspaper cartoonist! yet when working on disney he introdused realism to the movies, his style is impressive victor! im surprised! some day im gonna draw and animate like him ! :) im getting my Asociates in computer animation this year!